I was probably about five years old the first time I remember this tradition. It was the middle of the night. My mother woke me up, and told me to go to the living room and look outside. It was snowing. To a five year old, it has been a long time since it has snowed, and I was at the age I loved it. The moment was magical. My mother made some popcorn and hot chocolate and we ate and watched it snow. 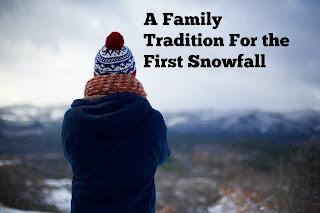 Every year after that popcorn and hot chocolate became our first snowfall family tradition. If it snowed earlier that day and was just a cold rain by the time we got home from school and work, we still celebrated the first snowfall. A few years ago, I was visiting friends and I was able to introduce their children to the joys of this tradition. Just like when I was growing up, we reached for Swiss Miss Hot Cocoa and Orville Redenbacher Popcorn. Only for them, they will only remember microwave popcorn and not making it on the stove. But the one constant in this tradition will still remain the same for them. That's so special! We have snow traditions at our house, too. We are rarely out of school for snow, but if we are, we make tomato soup for lunch.